One day seminar introduces the education and transformative model of EI using the Personal Excellence Map® and EI Coaching Map®. This life skills development seminar and facilitated learning experience includes a practical and self-directed learning program for achieving personal, academic, and career excellence. Price: $250 (plus expenses if exported to your location). 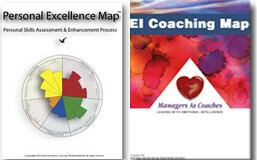 Includes Personal Excellence Map® (PEM®) and EI Coaching Map®.